Paul puts his DIY skills to the test as he creates the treehouse stand. Paul discovers that the washer that he used to attach the base board was too large for the hole in the second board so has to improvise. 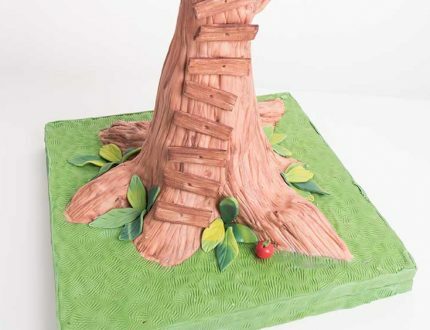 You can use rice krispie treats, but Paul opts to create the tree trunk using cake. He adds a couple of branches for good measure using wires and florist tape so you’ll start to see the design coming together. NOTE: Paul later discovers that he would have preferred to use 4 wires per branch rather than the 2 he uses. Slightly more challenging with all the nooks and crannies on the tree trunk and roots, but the usual ganaching processes here. 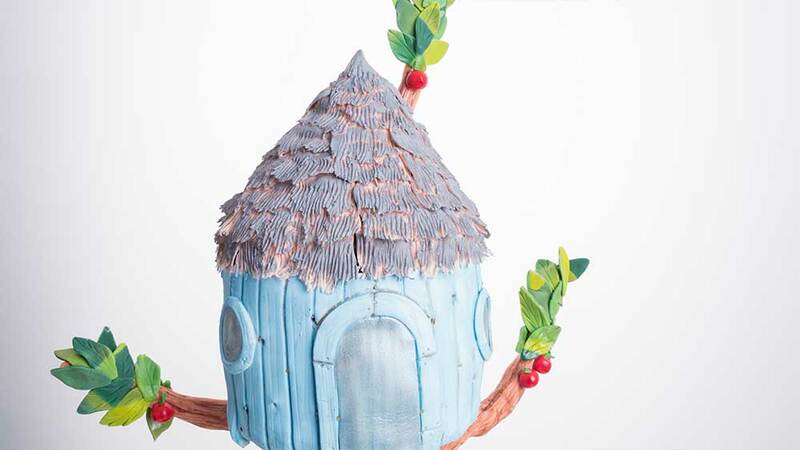 In this lesson, Paul makes the roof using cut out round cakes then goes on to ganache the roof. 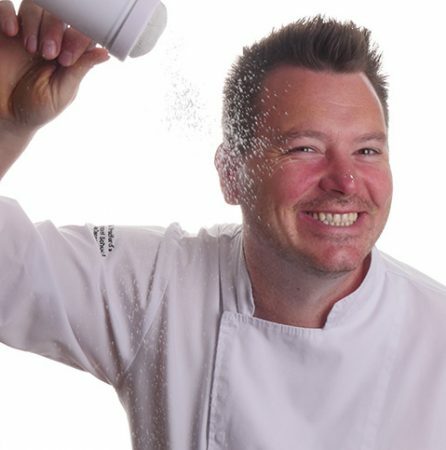 NOTE: Paul creates the roof from cake starting with 3 tiers but later realises that it’s too big. 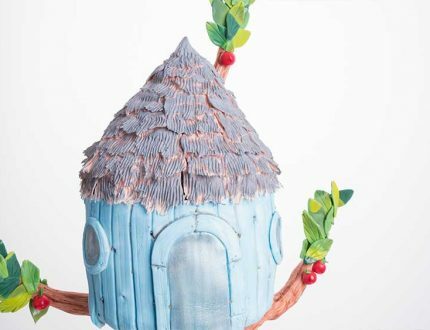 You only need to use 7cm and 9cm round cut outs and make the point using sugarpaste. Depending on how you got on in Lesson 4 you may not need this one, but if you want to carve the roof to shape then watch how Paul neatly changes the shape and overall effect of the roof. You can be sloppy here and get away with it, no need for a very neat finish as Paul shows you how to get a great bark effect free hand after covering the tree trunk. In this lesson, Paul covers the tree house by rolling, marking then merging the pieces on the side of the house. He later adds some texture before later adding the colour. This is where you’ll be glad you used 4 wires per branch as Paul struggles with the weight of the sugarpaste. In this lesson Paul shows you a great technique for creating the thatched roof. Paul recalls some childhood memories as he prepares the ladders, windows and the door. The board needs to show the grass effect to show off the treehouse. Paul talks about a number of ways to get the grass effect but he goes for the shell tool effect. Paul creates a lovely marble effect using a mixture of leave colours. It’s just a case of cutting out the leaves and leaving them to dry on the former. NOTE: Paul decides to texture only half the 120 leaves he’s made. Paul always likes to work in odd numbers for decorations so he had to create a third branch. This of course comes down to personal choice. NOTE: Paul adds the ladders before realising that it would be far easier to paint the tree first! Paul experiments with some colours before settling a mix of chocolate brown and white dusts mixed with vodka to help with drying. Going for a grey roof Paul mixes black and white to get the shade he’s after then gets to work painting. 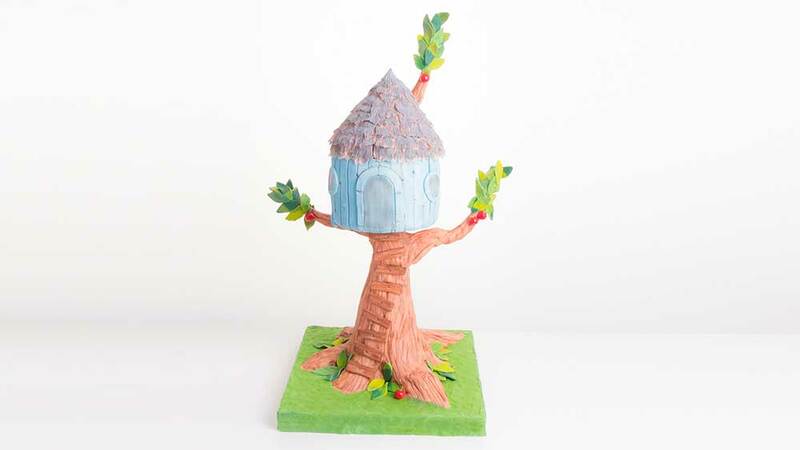 Using one of Paul’s favourite colours periwinkle blue Paul paints the tree house. It’s given him an idea for his own house! He then goes on to shade the ladders and give tone to some of the tree trunk. It’s your choice, but Paul goes for a satin silver dust to paint the windows and door. Paul explains a near disaster when the sides of the tree house started to move. He found a solution so it’s these little hints and tips that help. He then, nervously, starts to add the leaves. Paul brings it all together by decorating the board, scattering leaves and adding some cute little apples. Paul shares with you some other ideas you can create with this design. 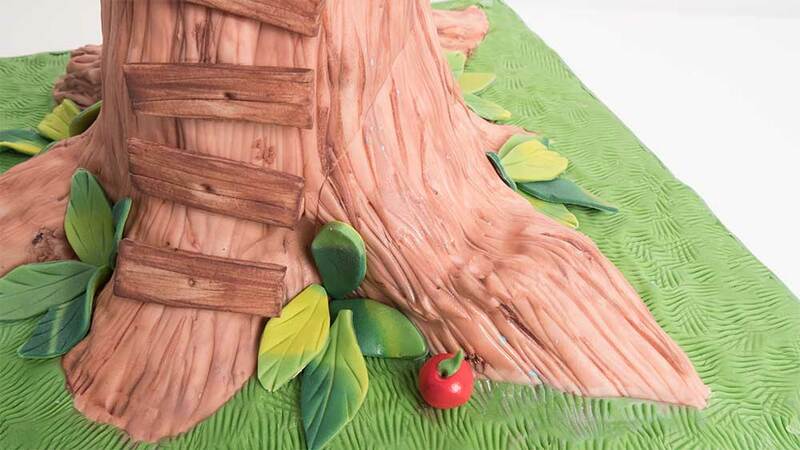 All the important information that a professional cake decorator needs to know for a design like this. 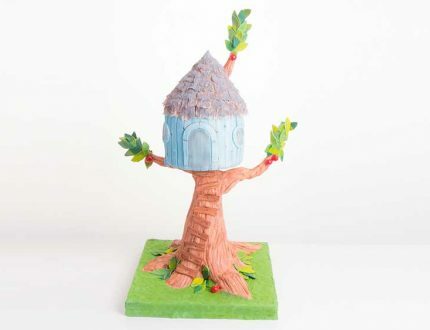 Highlights of our old treehouse cake tutorial. 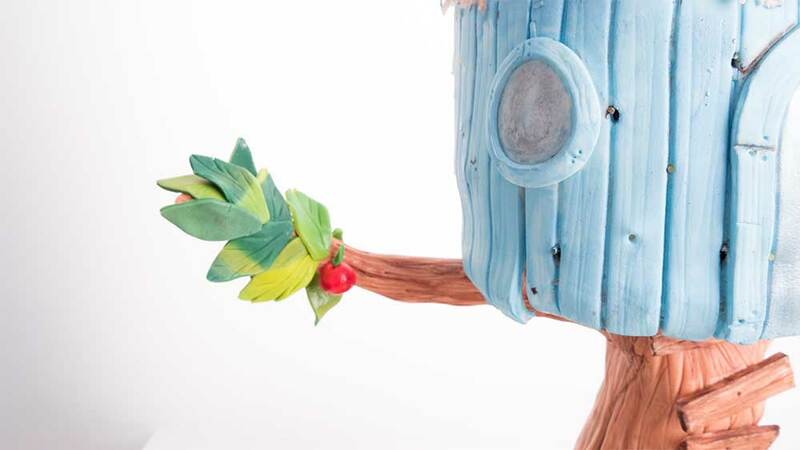 Learn how to make an old treehouse cake with the multi-award winning Paul Bradford. 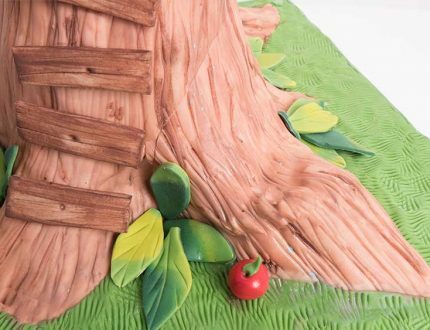 A fantastic and unique design, this cake is sure to catch the eye and can be interpreted in many ways! 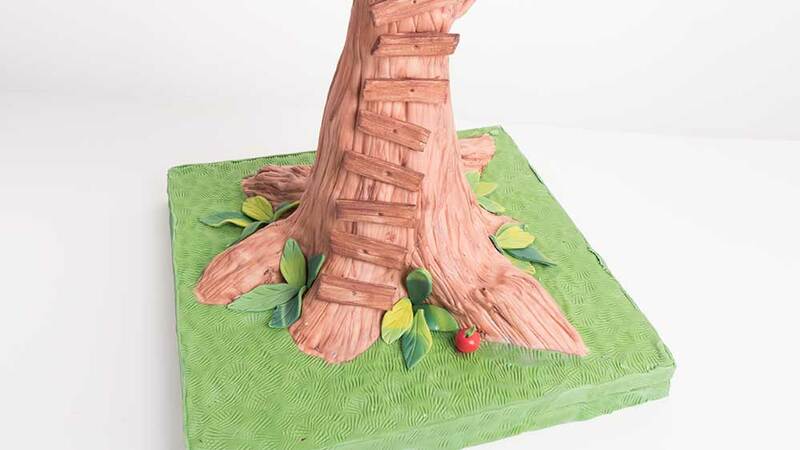 Don't forget to share your interpretations of this wonderful cake with Paul and the rest of the Sugarcraft community on our Facebook group. Who knows? 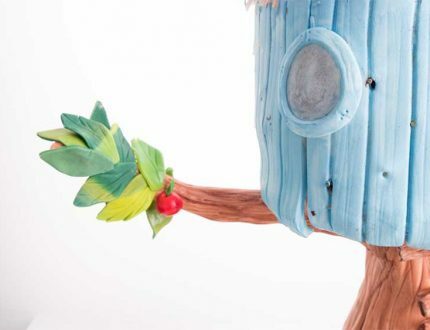 You may even end up featured in one of our monthly members' cake showcase.